Electrostatic Propulsion focuses on issues, trends, and developments in electrostatic propulsion. The compilation is composed of technical papers primarily based on the symposium of the American Rocket Society held at the U. S. Naval Postgraduate School in Monterey, California on November 3–4, 1960. 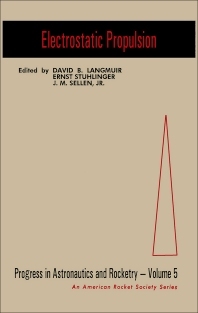 The book presents an investigation of the performance of ion rockets employing electron-bombardment ion sources. It also underscores the value of duoplasmatron in ion propulsion. The compilation then looks at the development of a negative ion source. Calibration of mass spectrometer, description of ion source, and the theory of surface ionization are described. The book also discusses experiments on oscillating-electron plasma source; the theory of ion emission from porous media; and the effects of surface structure and adsorption on the ionization efficiency of a surface ionization source. The text also considers a number of experiments, including the space-charge theory for ion beams, circular beam neutralization, and transient and steady state behavior in cesium ion beams. The book is a good source of information for readers wanting to study electrostatic propulsion.